I've been using this method for over 4 years now, with a little tweaking along the way, and have found it greatly reduces my set up and break down times. 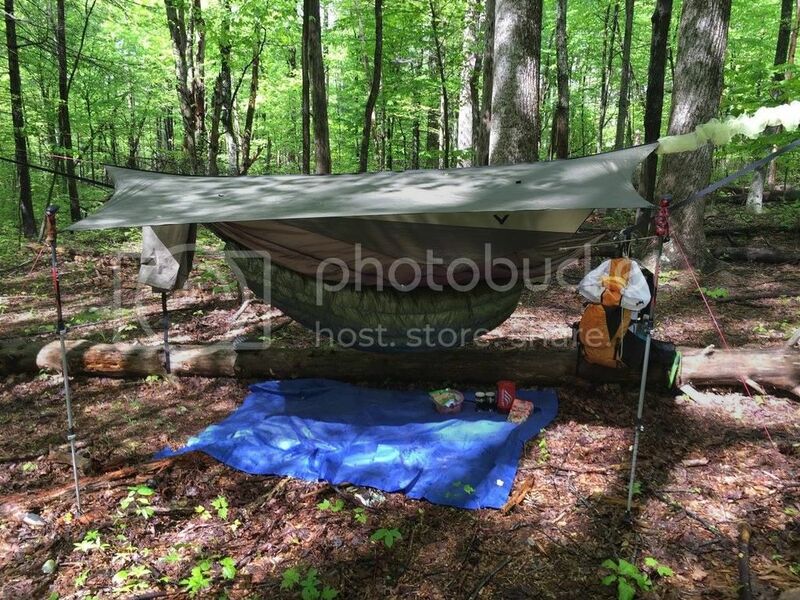 I use a 20 ltr dry sack now (used a trash bag in video) to house my sleep system (hammock, UQ, TQ, pillow, sleep wear, etc.) The dry bag makes pulling everything out of back pack so much easier than using a trash bag. I believe Jaxx ( bearded hiker) uses a similar setup. Yeah, the first place I saw this type of setup was Jeremy over at BonefireGear. He's got a video out there that shows how he does a similar setup. I've been working on something similar using muletape and a couple of knots. Using this system, if it rains and your tarp is wet, how do you keep the rest of your stuff dry? (I haven't yet watched the videos so if the answer is there I apologize). johnspenn wrote: Using this system, if it rains and your tarp is wet, how do you keep the rest of your stuff dry? (I haven't yet watched the videos so if the answer is there I apologize). Looks like the hammock and quilts are packed separately, in the common fashion. Only the tarp stays attached to the suspension. When this suspension is up, then the hammock and quilts are attached to the same suspension. Is that correct? Thanks for these videos, very interesting! Sorry, my question wasn't clear. Thankfully y'all overcame that fault and answered it anyway. Thanks to both. That makes more sense to me now. Thank you.